FILE - A combination photo shows CIA Director Mike Pompeo, left, in Washington, North Korean leader Kim Jong Un, center, in Pyongyang, North Korea, and U.S. President Donald Trump in Palm Beach, Florida. The U.S. election calendar could be a key factor in determining the scope and timing of a potential deal to end the North Korean nuclear program. Planning is progressing for both the upcoming summit between North Korean leader Kim Jong Un and South Korean President Moon Jae-in at the end of April and the expected meeting between U.S. President Donald Trump and Kim in late May or early June. President Trump said Tuesday that there had been talks at “extremely high levels” between his administration and the North Korean government. Later it was reported that Mike Pompeo, the director of the Central Intelligence Agency and a secretary of state nominee, met recently with Kim Jong Un in Pyongyang. Trump also noted the talks have been marked by “a lot of goodwill” and that “there has been a major change in terms of North Korea’s behavior,” since Kim’s Olympic outreach this year, in which he sent a large delegation to the Pyeongchang Winter games in South Korea, suspended nuclear and missile tests, and expressed a willingness to engage in denuclearization talks. The turn toward diplomacy has reduced, for now, the potential for conflict over the North’s accelerated efforts last year to develop an operational nuclear-armed intercontinental ballistic missile that can reach the U.S. mainland. FILE - A visitor walks by a TV screen showing file footage of South Korean President Moon Jae-in, left, and North Korean leader Kim Jong Un, right, during a news program at the Seoul Railway Station in Seoul, South Korea, March 29, 2018. 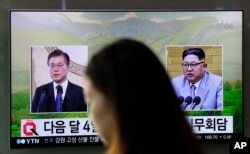 The North Korean leader’s decision to engage in denuclearization talks was likely motivated by both Trump’s “maximum pressure” campaign, which increased sanctions and the threat of military action against the North, and by South Korean President Moon’s reassuring outreach efforts to improve inter-Korean relations. Trump’s motivation in pursuing a nuclear deal with North Korea, in addition to resolving a growing national security threat, could also have a political component. According to North Korea analysts at the Sejong Institute in South Korea, the Trump administration is likely calculating how achieving such an agreement could help boost the president’s chances for re-election in 2020. “If I were Trump, I would try to make a tangible accomplishment on the North Korea nuclear issue within the first term by 2020, and in my personal opinion, that would be a really huge achievement for Trump,” said Lee Sang-hyun, with the Sejong Institute. The North Koreans would also likely prefer to complete a nuclear agreement with Trump before 2020, for fear the president could lose his re-election bid and the next administration would call for a review of the negotiation process. 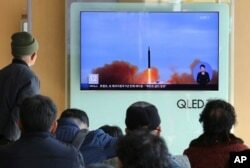 FILE - People watch a TV screen showing file footage of North Korea's missile launch at Seoul Railway Station in Seoul, South Korea, Nov. 21, 2017. The Trump administration has been critical of past nuclear agreements with North Korea that offered sanctions relief and other economic incentives for denuclearization promises that were later broken. This time around the U.S. is insisting on real progress on the complete, verifiable and irreversible dismantlement of the North’s nuclear program before any sanctions concessions are considered. John Bolton, the president’s national security adviser, has said North Korea should follow the Libya model, in which long-time Libyan President Moammar Gadhafi agree to give up all weapons of mass destruction in 2003, and soon after allowed in international inspectors to verify and oversee the dismantlement efforts. If Kim and Trump reach such a deal in early summer, it is possible that inspectors could conceivably be deployed to North Korea by October, just before the U.S. midterm legislative election, in which many Republican Party candidates affiliated with the president will face highly competitive races. “Just by showing the scene of an inspection team entering North Korea, President Trump would have plenty of things to show for the election that will be held in November this year,” said Woo Jung-yeop, with the Sejong Institute. For North Korea, the Libya model is a cautionary tale that ends, not with nuclear dismantlement, but with the civil war that erupted after, followed by a U.S. supported intervention and the violent overthrow of the Gadhafi government in 2011. Pyongyang has called for a step-by-step model, matching each denuclearization act to a specific concession, which would be implemented over a longer timeline to ensure the stability of the Kim government. South Korean officials said Wednesday that the upcoming inter-Korean summit would also focus on formally replacing the armistice that ended the Korean War in 1953 with a formal peace treaty that would normalize relations and increase security cooperation. “Our government is striving for such an end of war declaration and building a permanent peace regime,” said Unification Ministry spokesperson Baik Tae-hyun. South Korea and the U.S.-led U.N. force are technically still at war with North Korea, after fighting ended with a truce, not a peace treaty.